get a healthier body in just 3 days! Ready to loose weight? BUY NOW! 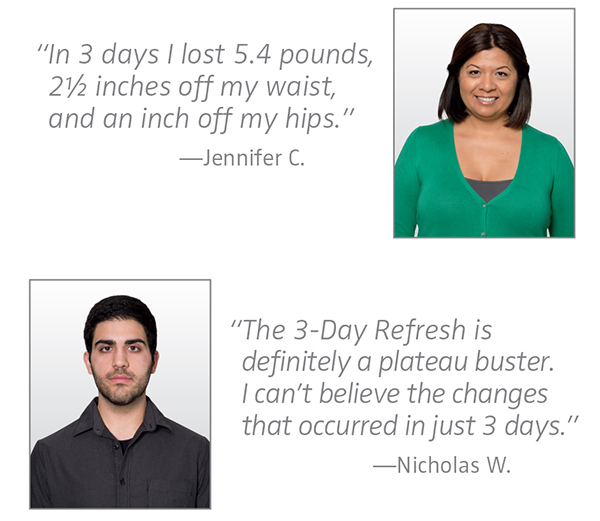 Top benefits of The 3 Day Refresh! to eat pretty well but have recently fallen off the wagon and need some help getting back on. to jump-start healthy eating habits for a new workout program. to quickly lose a few pounds for an upcoming event. been a healthy eater, but are ready to kick-start better nutrition for the first time. food and want to be satisfied while you lose weight and get healthier. 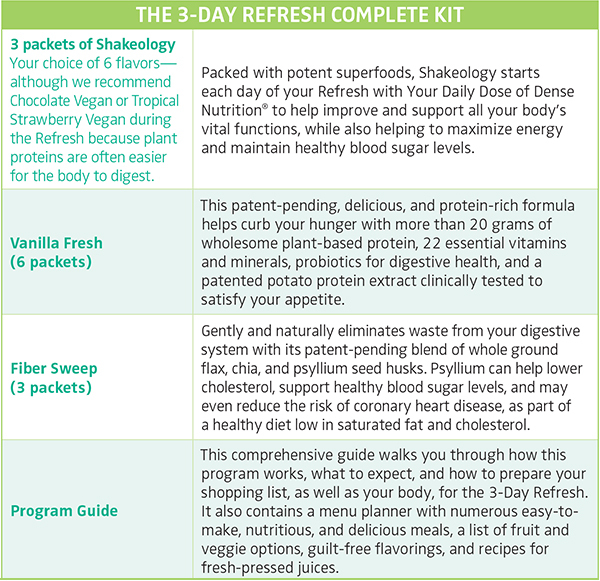 The 3-Day Refresh is a low-calorie program (about 900 calories a day) but because the shakes and fresh food selections are high in protein and fiber, they will help keep you satiated throughout the day. Because this program is packed with fiber, if you don’t already have a diet that’s high in fruits, veggies, and whole grains, it’s a good idea to prepare for the 3-Day Refresh by eating a large salad and/or a few servings of fresh veggies throughout the week leading up to it. If you get a little gas or bloating, this is a sign that you need to up your fiber levels in general. Fiber promotes satiety, balances blood sugar, promotes cardiovascular health, and keeps your digestive tract functioning. If gas is an issue, we’ve highlighted the “low gas-producing” options in the veggie list and dinner recipes in the menu guide. It’s also incredibly important to stay hydrated during the 3-Day Refresh. Water is the body’s lubricant and is required for every major process. It keeps your digestion flowing, flushes out toxins, keeps your system balanced, and helps control hunger. We recommend drinking half your body weight in ounces every day. So, if you weigh 150 pounds, you should be drinking at least 75 ounces of filtered water every day. EveryBODY is different. So everyone has a different reason for doing a cleanse. You can use it anytime you need to lose a few pounds quickly. Or kick-start a cleaner diet. Maybe after a long weekend of eating everything in sight. When you want your clothes to fit a little looser. Before, during, or after a workout regimen. you may choose to do it once a month to keep your habits sharp and your body healthy. You can pretty much do the 3-Day Refresh whenever you feel like recharging. 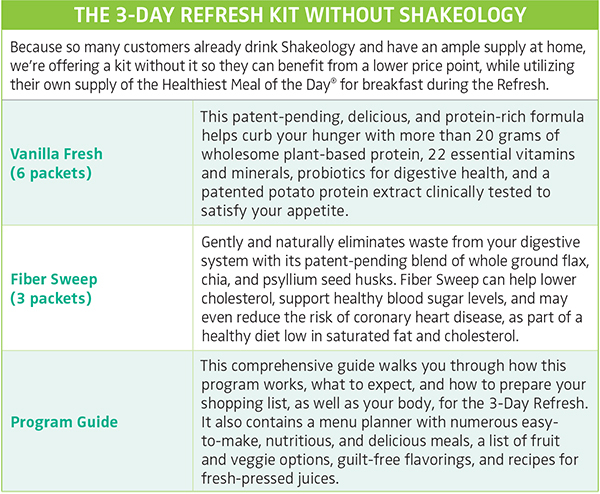 WHAT’S INCLUDED IN THE 3-DAY REFRESH KIT?